Chey Dunkley has called on his Latics team-mates to “stand-up and be counted” ahead of their Good Friday trip to promotion-chasing Leeds United. The defender hopes a repeat of last Sunday’s performance against Norwich – when they nearly took all three points from the Championship leaders – will help them topple the Yorkshire outfit and boos their survival hopes. 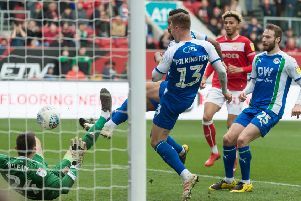 But Latics’ form on the road has given little cause for optimism this term, it’s the worst in the EFL, and Dunkley says that has to be put to one side. “It’s the business end of the season, and we know we have to be on it,” he said. “We’ve had a lot of disappointment this season – we know that. “But if we can just come through the other side, we can evaluate how far we’ve come, and look forward with positivity. Having been relegated last time they were in the Championship, Dunkley knows the importance of consolidating their place, but says the task is even harder than earning promotion. And despite the satisfaction of winning the League One title last season, Dunkley doesn’t want to have to do that again. “We’ve worked so hard to get into this league – and it’s probably even harder to stay in here,” he said. “No disrespect to League One, but we breezed it last season, winning promotion. Reflecting on Sunday’s stalemate at home to Norwich, the former Oxford United player admitted The Canaries late equaliser from Teemu Pukki was a difficult pill to swallow. “We played well for 90 per cent of the game, switched off a bit for their goal, and that’s probably been the story of the season,” said Dunkley. “But we’ve been excellent at home, we know we’re a different animal here to what we are away. “We thought we’d done enough to win the game, but it wasn’t to be.